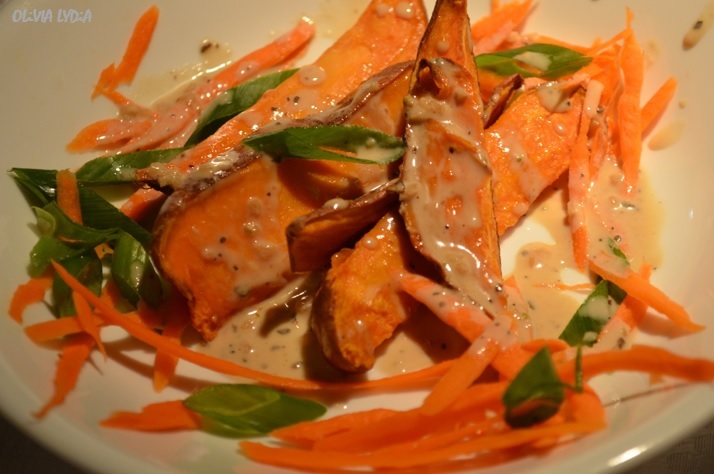 Roasted Sweet Potato Wedges Topped with Warm Tahini Sauce – Olive For Greens. Sweet Potatoes are often cooked with syrup, cinnamon and butter. Or, they are cut into french fries then deep fried. Let’s step away from that! How about we cut them into wedges and bake them. Why stop there when we can drizzle a warm tahini sauce over them rather than ketchup! Tahini is simply ground sesame seeds (looks like a nut butter). This is a great meal for a cold or rainy night. 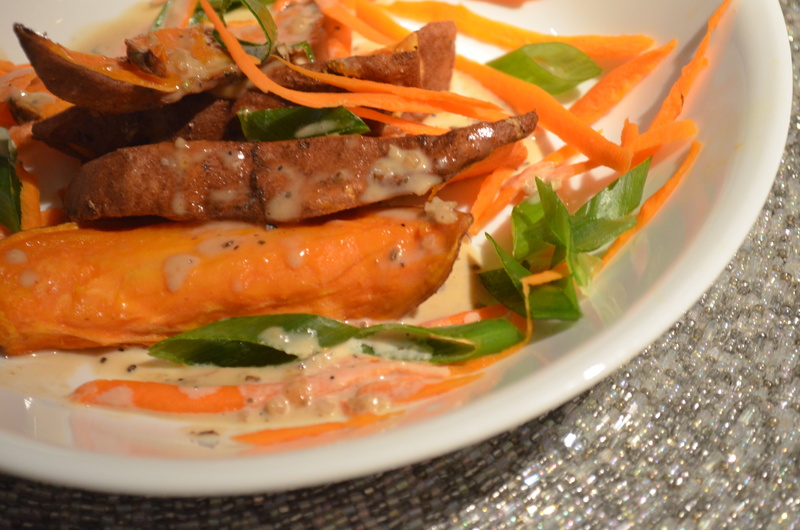 The warm roasted potatoes and cozy tahini dressing pair perfectly with the crisp crunch of carrots and scallions. Place the potatoes on a baking sheet with parchment paper (or in a glass baking dish) then drizzle a light coat of olive oil over with a sprinkle with sea salt. Bake at 400 degrees Fahrenheit for 30 minutes. Meanwhile, combined the carrots and green onion in a small bowl- set aside. After 20 minutes of baking the potatoes, prepare the tahini sauce. In a small bowl mix the tahini, tamari, honey, coconut milk and nutmeg. In a saucepan add the vegetable broth, garlic cloves, oregano and pepper on low heat. Lightly sauté for about 2 minutes. Add Tahini mixture to pan. Simmer for about 5 minutes. Place the potatoes in a shallow bowl. Top with carrot mixture. Drizzle desired amount of warm tahini dressing. Learn a bit more about Tahini here! Pingback: The Comfort Zone Kibosh | OliveforGreens!